I spent the majority of my first trip up Mt. Sanjo in the middle of a massive world of cloud, so when presented with a fair weather opportunity to get revenge on the peak, I took Paul up on his generous offer to carry both the tent and cooking gear. We boarded an early morning Kintetsu train to Shimoichi-guchi before boarding that familiar bus to Dorogawa hot spring. 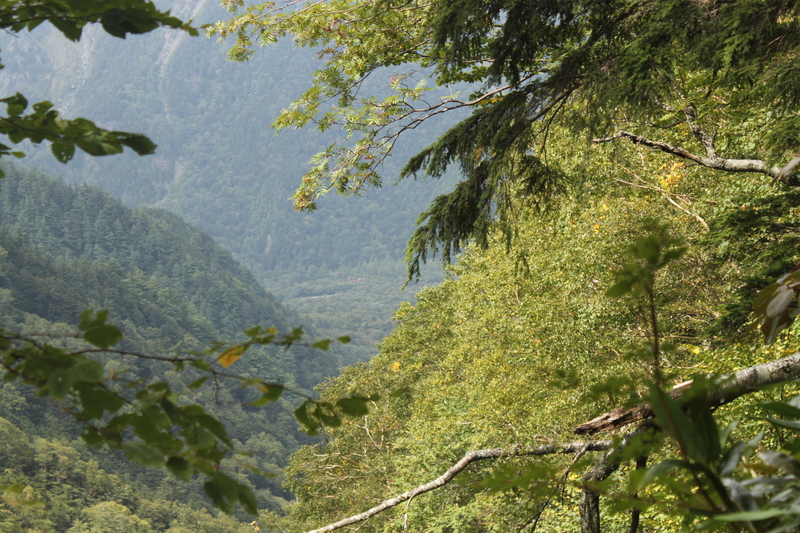 It had been nearly a decade since I had been in the Omine mountains, and the memory of the trail had started to fade. For one, I didn’t remember walking so long on the paved road out of town just to reach the trailhead. After stopping to fill up on water at the gorogoro water source, we arrived at the cemetery marking the path entrance, sometime in the early afternoon under a crystal blue sky and a light, chilling breeze. The sign forbidding women to enter the ‘holly’ mountain still stood, though a bit more weatherbeaten than before. The first part of the trail tramps through a forest laden with planted cedar and cypress before skirting the edge of the valley towards the untouched deciduous heights of the main ridge line. We passed through a deserted tea house built directly over the trail that likely serves refreshments to the hoards of pilgrims that make their way to Sanjo every year, but then again I wouldn’t know. My first time here was also out of season, with everything boarded up for the winter. In fact, the entire mountain lay deserted in the early November haze. Paul and I marched on, reaching the junction of the main ridge sometime around 3pm or so. A giant statue of Bishamon, the guardian of these lands, met us and looked ready to interrogate about our unsolicited visit. 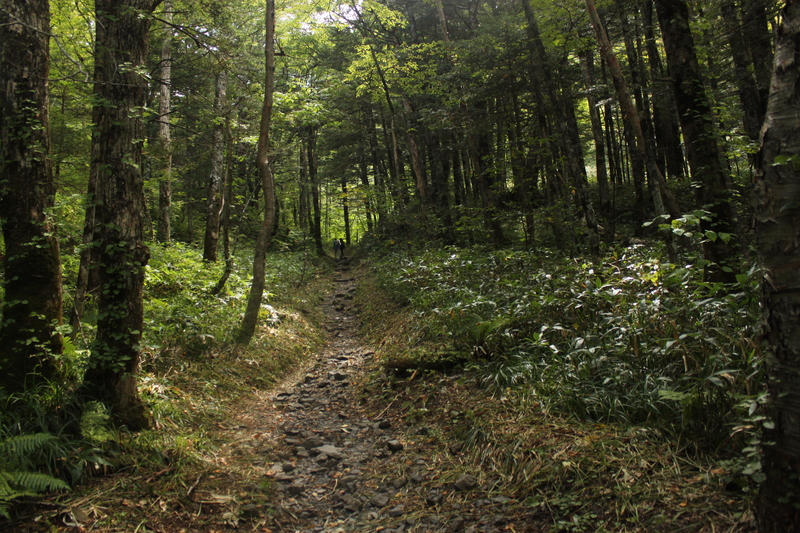 The trail to the left pointed us in the direction of Yoshino, two dozen kilometers away. To our right, we could stay on this ridge all the way to Hongu shrine if we felt so inclined, nearly 100km in the other direction. We turned right and soon reached another boarded up tea house, the walls of which were adorned with hundreds of business cards fastened by pilgrims and other visitors. Not to pass up an opportunity for free advertising, I made some space on the wall for one of my own. The trail rose through an area of boulders on our right, which led to an outcropping with the blue kanji letters 西の覗 carved intricately into one of the boulders. During the summer, buddhist monks will hang you over the edge of the cliffs by your feet while testing your devotion to Buddhist teachings, but only during the months that the temple is actually in operation. In the late afternoon light we stared straight down into the valley awestruck by the beauty encapsulating the sacred peak. We pushed on, reaching the deserted temple complex just as the evening clouds invaded the peak. Our views towards Nara were obstructed by the damp mist, so we retreated further south along the ridge, to a small wooded campsite marked on the map as the only place to stay in the off season. Arriving shortly before dusk, we contemplated setting up the tent before opting for the comfort of the small shack that served as an emergency hut. The hut which sleeps 4 comfortably, was occupied by Fukayama-san, a late-20s, male Japanese hiker out on his own. He had also finished climbing the Hyakumeizan, and we immediately hit it off. He was on assignment to gather data for his amazing blog of panoramic mountain photos. 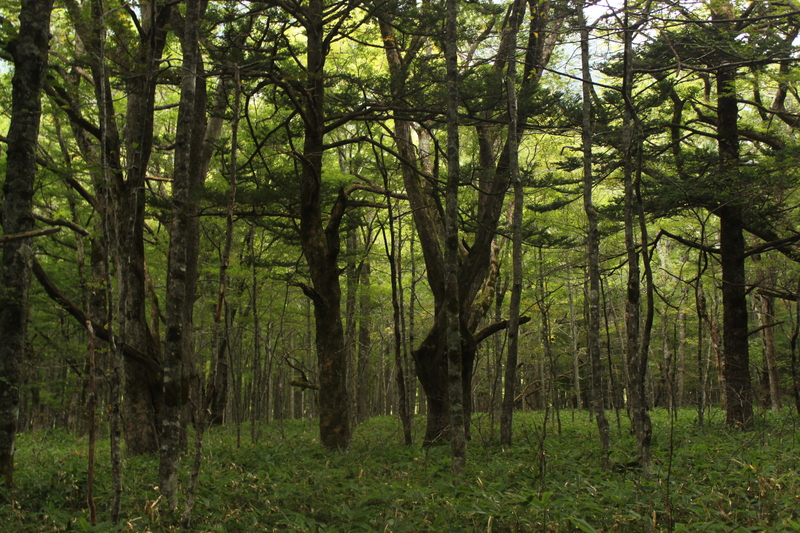 Back on Tanzawa a few years back, I had met the acquaintance of a man named Satoshi who also took advantage of the digital technology to produce panoramic photos. How many more of these talented bloggers would I cross paths with? Paul and I cooked dinner in the fading light and tried unsuccessfully to keep a fire going in the dampness of the evening fog. We gave up, retreating to the comfort of the hut, which sheltered us from the approaching winter winds. The next morning, Fukayama headed out in front of us, wanting to get photos of Mt. Inamura on an adjacent ridge, while Paul and I leisurely downed our breakfast of muesli and coffee. We hit the trail shortly before nine in the morning, retracing our footprints back to Sanjo before turning north to follow in Fukuyama’s shadow. Along the way, we passed by a group of 5 hikers, including two females who brazenly ignored the antiquated men-only rule. The route from Senjo took a nosedive, dropping off the side of a cliff before skirting around some multi-story rock formations. Ladders and metal platforms demanded our mental skills and energy, zapping excess reserves from our wary bones. By the time we bottomed out at the pass, I plopped down on the foundation of a wooden shrine gate marking the edge of the gender zone. Someone had scratched out the “No” on the No Women Allowed sign. Perhaps it was the same hiking party we’d met a few minutes earlier. As if driven by an internal magnetic force, I sat crashed out, refusing to budge. “Paul, I think I’m done,” I sheepishly confessed. Perhaps it was the lack of sleep or a mineral imbalance, but the thought of heading another hour along the ridge to Inamura was inconceivable. Just as we were deciding how to proceed, a few sprinkles fell from the sky. The clouds were closing in and the forecast wasn’t looking good. On our maps, a dotted trail led from our current position back to Dorogawa, as we made the conservative decision to seek shelter further below. Inamura would have to wait. Dropping down into a forest ablaze with color wasn’t such a bad thing. My spirits perked up and I felt a lot more alive with energy once the pressure building up in my ears was released. Paul led the way through a spectacular collage of orange oaks and yellow maples, while we followed the watershed down to civilization. The rain held off for the time being, and by the time we reached a forest road several hours later both of us were screaming for nutrients. At the edge of a retaining wall we dangled our feet. Paul boiled water while I prepared the tuna salad sandwiches. The coffee flowing through our veins took our minds off the aching muscles and we sat back for a moment, reflecting on our progress. Sure we didn’t make our second target peak, but at least we had found one of the better gorges in the area. On the walk back into town the skies opened up and both of us praised our fortunate decision. After a quick bath at the hot spring, we headed back to Osaka with fresh thoughts of Inamura’s untapped crags. 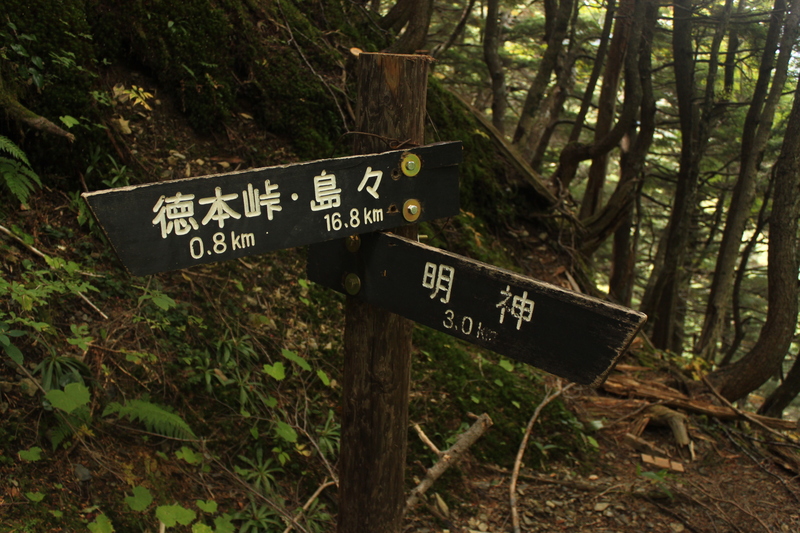 Even though it is labeled as Chapter 3, this is the first in a series of articles that chronicle my attempt to do a day hike with every single Japan-based hiking blogger. Chapter 1 involved an ascent of Mt. Ibuki with cjw, while the 2nd installation depicted the scaling of Mt. Kaya with Hanameizan. Peter Skov is a Saitama-based Canadian photographer, whose wonderful blogs Tsubakuro and Project Sannmyaku archive trips throughout the Japan Alps to capture the wonderful alpine scenery of Japan’s 3000m peaks. We first met back in the summer of 2012 while doing a interview with Yama-to-keikoku magazine about hiking manners in Japan’s mountains. Both of us thought it would be a good idea if we could plan a hike together in the not-too-distant future. I mentioned my plan to climb some peaks around Lake Haruna just before the New Year’s holiday, and Peter arranged to free up his schedule for the 90-minute drive from Saitama. As Kanako and I gathered our gear in our modest room of the Kokumin-shukusha, Peter chilled in the lobby lounge perusing through guidebooks about the numerous hiking trails in the area. After check-out, we traveled up route 33 to the pass, where a red wooden shrine torii marked the entrance to the ice-crusted trail. We marched in unison, admiring the lack of cedar trees on the sasa-lined path. The inline rose steadily to the base of a small shrine, where the route met the ridge. Here the three of us were greeted by the Siberian winds howling from the north. I zipped up my outer layer, turning my head to shield myself from the bone-chilling gales. The sun shone brilliantly through the navy-blue sky, with a wall of thick white cloud behind. The peaks of northwestern Gunma Prefecture were definitely getting a healthy dose of winter today. The path led straight up the spine of Mt. Souma’s knobby flank, via a series of near-vertical ladders. I’ve never been a fan of these things: climbs are quite fun and challenging but I’d much rather not descend down these things. If there’s an alternative route I would definitely make use of it on the descent, but this is the only way up and down the peak, so here we were. Luckily we were shielded from the winds by the immense rock wall directly above, but once above this tricky part, the brutal winds threatened to push us off the mountain. It only took about 20 minutes of skillful rock scrambling to reach the summit, which housed a small shrine in addition to several statues placed by the Shugendō devout. Peter, Kanako, and I rested leisurely, exploring every inch of the exposed summit in search of the perfect angle to digitally capture the scenery. Bare tree branches obstructed the views to our north, but the entire Kanto plain spread out directly in front of us like margarine on a piece of toast. The toast, in our case, was Saitama Prefecture, covered with a sprawling expanse of concrete development as far as the eye could see. Posing as a turtle in a pond of curvy mountains, Japan’s highest peak poked its head about them all as if waiting to be fed by the deities above. The warmth of the solar radiation was most welcome, with the shrine providing a adequate screen from the piercing winter winds. Our next challenge was getting back off the knuckle-shaped summit plateau and back onto the long route out towards Lake Haruna. We eased into position and carefully lowered our bodies over the ladders until bottoming out on a well-worn path. From here we flowed along the undulating ridge, glancing back every few minutes to take in the full scale of Mt. Souma’s impressive cliffs which happen to be Haruna’s second highest summit and main target for Ni-hyakumeizan baggers. Next we hit a small gazebo before gently ascending to the base of a towering rock spire known as Surusu rock, where we found a small grotto filled with buddhist statues and sanskrit etchings. In the old days this entire area was a stomping ground for Esoteric Buddhism but now the rocks are visited by regular folk looking for a hawk’s eye view of Haruna’s perfect cone. The trail squeezed between an opening in the rocks before leading to a long ladder that brought us to the top of the rock formation. From here, the views were straight out of a Vittorio Storaro work. As the afternoon waned on, we thought it best to make a move back towards our waiting automobile, so instead of continuing along the ridge, we spied a short-cut that would take up back to the main road, where we could simply walk up the gently-inclining asphalt back to our car. The road was filled with unevenly spaced grooves, whose pitched changed as cars filed past. This is known as a ‘melody road’ in Japanese, and the tune in question this time bore a strong resemblance to the Incy wincy spider. It was around 3pm by the time the ignition was started in the car, so it was decided a side trip to Haruna shrine, a venerated power spot in the area, was in order. The walk through the cryptomeria-lined forest was frigid in the late afternoon light, but the mysterious rock formations more than made up for our discomfort. Peter and I raced around capturing the scenery from different angles while Kanako rested on a nearby bench, looking cold and somewhat miserable. Eventually we got out of there just in time to see the moon rising over an adjacent ridge. Peter dropped us off at our hotel while he headed back to Saitama. It was great to finally do a hike with someone whose photography I had admired for some time. Putting faces behind the bloggers is a bit like unmaking a voice actor for your favorite muppet character: you never know what to expect and you’re often pleasantly surprised by what the person is really like. Peter and I vowed to do more hikes together in the future when time allows, and I definitely plan to make due on our promise. Doai station, for those who have never had the pleasure of visiting, looks like it was lifted straight from a low-budget horror flick. Dark and damp, with a cool musty wind and mysterious shadows flickering in the poorly lit hallways. There would be no way I’d sleep in the station, and with the approaching storm, my only option was the fluorescent illumination of the station waiting room, who I shared with one other man sporting nothing other than the clothing on his back. What in the world was he doing here? “I lost my wallet,” confessed the frail, bespeckled 40-something loner. “My friend is delivering me some money on the first train, so I have to wait until then.” He seemed like a harmless enough fellow, so I drifted off to sleep and put my valuables inside my sleeping bag just in case my new companion had other ideas. The next morning strong winds and heavy rained bounced off the asphalt like under-inflated volleyballs, and I knew that trying to climb Mt. Tanigawa would be an exercise in futility. I stared at the maps, checked over the train schedules, and changed tack. Naeba would be much easier to navigate in the rain than the rocky cliffs of Tanigawa, so I got on the local train to Echigo-yuzawa station, which is boarded in the middle of the tunnel under Mt. Tanigawa. When the train reached the end of the tunnel and popped out in Niigata prefecture, I was shocked to find the valley bathed in sunshine. I knew the right decision had been made and wanted to make full use of my time on Naeba, so I hailed an outrageously expensive taxi to the ‘Wadayama’ approach up Mt, Naeba. “Sure, you can stay here tonight”, returned the manager of Wada hut. The large dining room lay completely deserted as I dropped off my extra gear for the lightweight jaunt up the slopes, who still held their quilt of cloud in the manner of a snugly sleeping toddler. I donned on my red rain suit and shot up the moist riverbed towards the top of the ski resort. In the winter, hoards of skiers and boarders would be sliding down every available inch of powder, but here in the early autumn gloom I marched alone, guided only by the thought of knocking off #66 of the coveted 100. The next hour or so became a bit of a blur. Perhaps it was the monotony of slopping through marshlands on those wooden planks that offer about as much traction as a skating rink. Unheeded by the gently falling mist, I reached the ridge in relatively good time: it was sometime in the early afternoon and there were few other souls around. Everyone I met was already on their way off the mountain and they didn’t seem too thrilled with being robbed of one of the best views around. The path skirted through some rock formations before dropping to a broad saddle, marked by a swiftly flowing creek. Here I took my first break and rehydrated my soaked figure, which was wet not from the rain but from the sweat produced by wearing this unbreathable nylon coffin. I’m not completely sure why Japanese hikers prefer this sauna suits but I blindly followed this trend. At least I had enough foresight to unzip my rain jacket all the way to let the steam escape back into the environment. From here, the final push to Naeba’s level plateau ensued. Visibility hovered around the 3-meter mark as the winds threatened to push me off into an unknown abyss but I held my ground, topping out at the high point just in time to find the hut owner in the midst of an afternoon stroll. “Why don’t you stay here tonight?” the man inquired, but after explaining that all of my kit awaited me back at Wada he bade me a hearty farewell and I retreated back from where I had come. 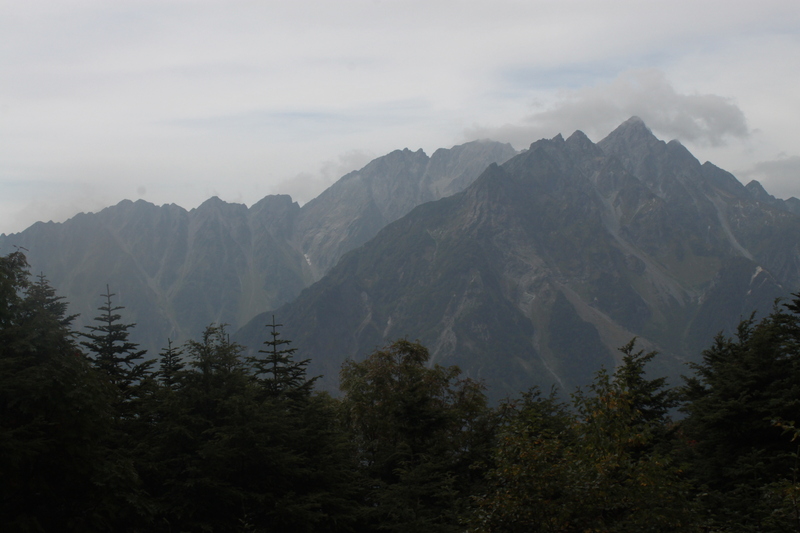 By the time I reached Wada hut the clouds had lifted, revealing mesmerizing views across the valley towards the peaks of Echigo. When I entered the hut I found out I was the only guest staying. The manager didn’t feel hosting a party of one, so after a little negotiating, he agreed to drive me all the way back to Echigo-Yuzawa free of charge if I were to help conjure up a fib about having a sick family member. He called his boss (the hut is owned by a big company, and the manager has to approve all transactions with the big man-in-charge). The reservation was canceled without a hitch and my main problem of getting off this mountain without my own transport was finally solved. Back at Echigo, I searched in vain for a quiet, dark, and dry place to sleep at the station before giving up and calling my friend in Tokyo for permission to stay. With that granted, I headed back to Tokyo even though I had plans to climb Mt. Tanigawa the following morning. Crazy? Yes. Foolish? Perhaps not as much. Long before the transport ministry burrowed a giant tunnel through Naka-no-yu hot spring, there was only one way in and out of Kamikochi. The path lie in the east, through the quaint village of Shimashima, along a fork in the Azusa river that led to a small gap between Mt. Kasumisawa and Mt. Chou called Tokugo pass. Walter Weston was perhaps the first foreign face to set foot upon the plateau, whose depiction is recorded in a diary entry from the summer of 1891: “The view from near the highest point of the pass is one of the grandest in Japan, so entirely does it differ in character from the ordinary mountain landscapes with their rounded outlines and verdure-clad slopes.” One mid-September morning, I set out with several members of the Hiking in Japan Facebook community in search of Weston’s lost view. On the flat, 3km walk from Konashidaira campground to the junction at Myojin hut, I set the stage by demonstrating my regular flat-ground walking pace, which my trusty companions watched with reserved envy. On challenging hikes I opt to cover as much of the easy ground as quickly as I can. A 5 to 6 km/h average walking speed is not entirely unheard of. As I rested outside of Myojin, Michael strolled in a minute or so behind me. Out of the rest of the members, he was the only most likely to keep pace for the remainder of the hike. Miguel, Naresh, Tomomi, and Baku each filed in one after the other, eager to enjoy the scenery as much as each other’s company. I’ve done that stretch of forest nearly a dozen times over the last decade or so, and the anticipation of possibly setting foot on some of the same stones Weston left his heel-print on was too much to bear. Michael led the way along the forest road that paralleled the swift moving mountain stream. In Weston’s time, the entire route most likely darted in and out of this water source, over weather-beaten boulders and snow sculpted waterfalls. I slowed up the pace, but once in the zone I knew that fighting my momentum would only expend more energy than necessary. That’s one of the main reasons why I never hike in big groups and also why I could never become a mountain guide: patience is one virtue that never stuck with me. To my utter surprise, our pace setter Michael had disappeared into the forest, long out of reach from my regular climbing march. I soon found myself completely alone as the route rose through a conservative array of lengthy switchbacks. Every now and again the views would open up towards the valley from which we had started, only to be enveloped by the thick greenery of the lush deciduous canopy. After crossing several small streams, I reached a signpost that indicated only 800 meters of horizontal distance to the pass. I contemplated taking my first break here, but one look at the altimeter had me rubbing my eyes as if I had seen a desert mirage: 2030 meters! 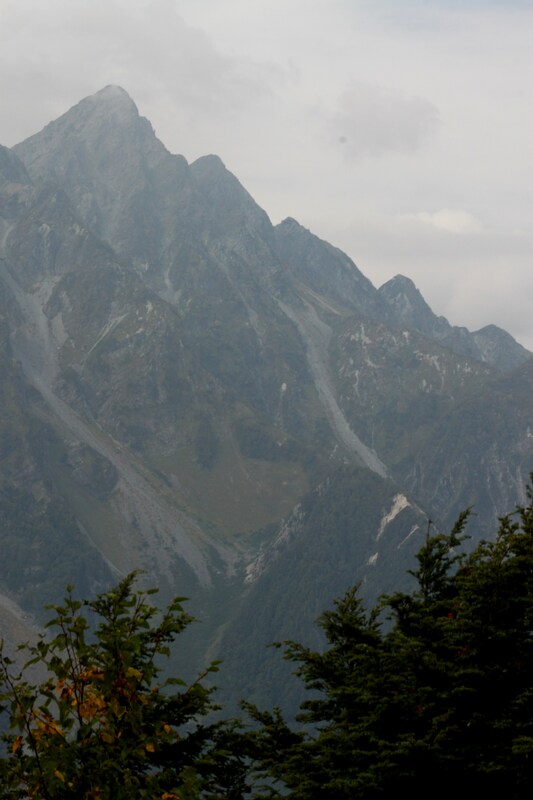 The pass lay only 100 vertical meters above, and it would have been futile to rest when my goal lay so close at hand. I hit the high point about 10 minutes later, where a small flat area crammed with tents beckoned me closer. To the left, a small, red-roofed hut sat nestled on the Shimashima side of the pass. Middle-aged hikers milled about, led around by a thin-skinned tour guide who barked instructions to the two dozen customers who monopolized every available rest space. If this guide ever tired of his profession, I’m sure he could easily get a job as a JR train conductor for his love of unnecessary announcements. Yes, a 1:45pm departure, you say? Please remind me thirty more times over the next two minutes. My headache is forever grateful. I found Michael seated at one of the benches, and after a quick refueling, we searched for the million dollar view that Weston had touted in his book. A small sign in the campground pointed to a lookout point only 45 seconds away. We reached a small clearing, where a young woman with a bandanna on her head stood, hand outstretched, with her cell phone searching for reception. It turns out she worked at the hut, and this lookout point was the only place on the mountain where you could actually get coverage. 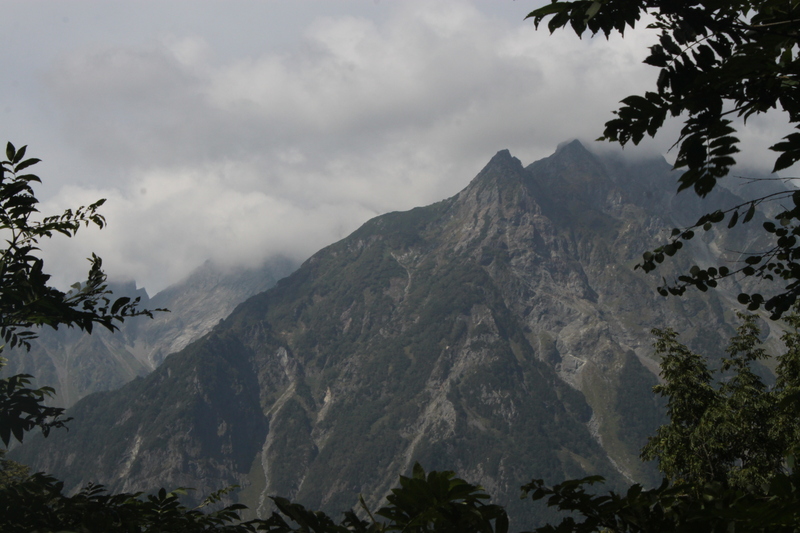 Turning towards the west, the towering spires of Mae-hotaka demanded our attention. The descent that Weston speaks of is a little mystifying, as the trail climbs towards the left from the lookout point towards the tree-covered summit of Junction Peak. Perhaps the original location of the Tokugo trail was a little higher up or a bit further to the east? As much as I had wanted to descend the other side of the ridge and out to Shimashima, our campgear and fire awaited us back at Konashidaira. One day I will embark on the full 20-km journey from Shimashima to Myojin up and over the great Tokugo divide. Until then, I’ll just have to keep chasing Weston’s faded footsteps over Japan’s long-forgotten routes.